Apple iPad Pro 10.5in review | What Hi-Fi? Ever since it first arrived in 12.9in form, the iPad Pro has been focused on creation – unlike the vanilla iPad, which has always been far more interested in consumption. That doesn’t change for 2017. This new 10.5in model is every bit the productivity powerhouse, with performance that’s on a par with some laptop PCs. An all-new display is what has really made us pay attention, though – and not just because of those skinny screen bezels. No, it’s because this iPad has the highest refresh rate you’ll find in a tablet. 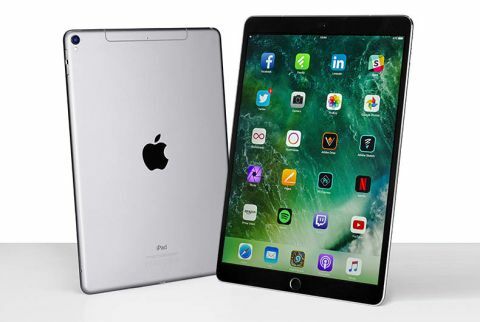 iOS 11 and its iPad-specific upgrades might still be months away from arriving and revealing the Pro’s true potential, but even now, this latest iPad doesn’t really put a foot wrong. You’ll have to break out a ruler to spot the difference between this new iPad Pro and last year’s 9.7in model. It weighs a paltry 30g more, and the dimensions have only increased slightly. From the back, things look almost identical, with the same protruding camera lens and antenna lines (which are only found on this cellular model). At the sides, you’ll find the same Lightning port for charging, and precisely machined holes for the four speakers – one at each corner for stereo sound. Apple’s Smart Connector, the trio of small pins along the left edge, lets you connect the Smart Keyboard (£160). This protective case unfolds into a kickstand and slim keyboard, which is ideal for writing anything longer than an email. It’s slightly bigger than the one that arrived alongside the iPad Pro 9.7, with full-size keys that are that little bit easier to type on at speed. The Apple Pencil (£80) works here too, letting arty types use the screen as a digital doodle pad. It’s even more responsive than it was on last year’s iPad Pro. It’s only from the front that you’ll spot the major change. Apple has shrunk the bezels around the screen, creating space to fit a 10.5in panel in a tablet barely any bigger than the outgoing iPad Pro 9.7 – a notable increase in screen size. Apple’s usual colour choices are all available – Space Grey, Silver Gold and Rose Gold, with the latter three matching the finishes of the iPhone 7 and iPhone 7 Plus. The iPad Pro 10.5 uses a 64-bit A10X Fusion CPU, which Apple says is 30 per cent faster than the previous-generation A9x. Apple’s delightfully simple iOS 10 operating system has never felt smoother or more responsive. It also sees a claimed 40 per cent improvement in graphics performance, which helps games maintain consistent frame rates. Battery life remains unaffected though, managing up to 10 hours of mixed use – just like the old iPad Pro 9.7. Prices start at £619 for a 64GB Wi-Fi only model. There are also 256GB and, for the first time on an iPad, a colossal 512GB version – the one we tested. All three are also available as wi-fi and cellular models. It’s unlikely to replace a phone as your go-to device for photos, but the iPad Pro 10.5’s camera is still able to put in an impressive performance. That’s because it uses the same 12MP sensor Apple uses in the iPhone 7, and is paired with the same quad-LED True Tone Flash. With it, you can take excellent still images, or film (then edit) 4K video. Quality is exactly on par with the iPhone 7, as you’d expect given the identical hardware – including optical image stabilisation to reduce hand shake. It doesn’t double-up on sensors for faking depth-of-field in the way the iPhone 7 Plus does, though. Photos are captured in DCI-P3, taking advantage of the iPad’s wider colour gamut for more colour variance and less banding. Up front, the 7MP FaceTime camera is also borrowed from the iPhone 7. It uses Retina Flash, turning the entire screen white to illuminate your face when you press the shutter button. The effect can be dazzling, but it’s also effective. The previous iPad Pro had a fantastic screen, but this 10.5in model improves on it in a lot more ways than sheer size. To keep display density the same as on the outgoing 9.7in model, the resolution has increased slightly to 2224 x 1668. Brightness has improved too, up to 600nits; combined with an improved anti-reflective coating, using it outdoors or in bright sunlight won’t be a problem. It uses the same DCI-P3 wide colour gamut as the 27in iMac with Retina 5K display, and has True Tone to automatically alter the white point in response to ambient lighting, which leaves a more natural picture. The major upgrade is ProMotion, a variable refresh rate that can push the display all the way up to 120Hz for ultra-smooth scrolling through web pages. Even on the iOS home screens, the effect is dramatic. It works in reverse, too. When you don’t need the full 120 frames per second, the panel can drop down to match your content – as far as 24Hz for watching 24fps movies without resorting to 3:2 pulldown. Picture quality is simply excellent, with brilliantly judged, natural colours. Watch Paddington and the reds, blues and yellows of the bear from Peru have beautiful saturation, without becoming overly vivid or unnatural. Sharpness is there when called for, without being overly aggressive, giving the mystic symbols and spells of Doctor Strange real definition. The screen can easily keep up with hectic action sequences, staying composed while an inter-dimensional New York folds in on itself. Contrast might not be as high as on an AMOLED panel, but is still exceptional for an LCD display. It’s possible to watch dark scenes in a bright room without being distracted by reflections, too. The iPad Pro 10.5 doesn’t entirely remove them, but they are even more subtle and subdued here than on the outgoing 9.7in model. Apple’s four-speaker system is unrivalled as far as tablet sound goes, and that’s still true on this new 10.5in iPad Pro. Both speech and music is much louder and clearer here than on lesser iPad models. It still automatically adjusts to output the best sound, based on whether you’re holding it in landscape or portrait mode. The extra speakers add detail over an iPad Air 2, which sounds less composed and coarse in comparison. You can quite easily rely on the built-in speakers to watch an episode of The Handmaid’s Tale, without having to reach for a pair of headphones first. They balance dialogue with soundtrack well, and don’t falter during more intense action scenes either. The iPad continues to impress when switching to a pair of headphones, such as the Philips Fidelio X2. Unlike the previous-generation model, which couldn’t match the iPad Air 2 for expression and liveliness, the 10.5in Pro has a clearer and more measured sound. There’s enough detail to give James Blake’s Retrograde the haunting impact it deserves without losing crucial balance and realism. Last year’s iPad Pro 9.7 was an excellent tablet, but its replacement is truly deserving of that ‘Pro’ label. It’s faster, with an even slicker design and truly fantastic image quality – even if the ProMotion display makes more of a difference to productivity than to Amazon Prime video. The four-speaker system delivers impressive sound, and ease of use is second to none right now. It’s the best tablet you can buy right now, and it only stands to get better once iOS 11 arrives.